I had the great opportunity to visit Northlandz in Flemington, NJ recently. I must say, I was truly blown away by the scope of this layout. Not to mention the fact that it was HUGE, it was also very detailed, artistically rendered and humorous in many areas. Did I mention it was HUGE? 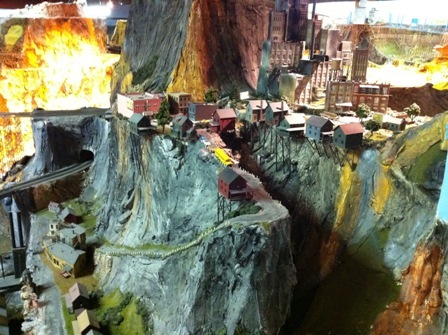 For me as a model railroader, seeing this exhibit was almost a Grand-Canyon-like experience. You really have to see it to believe the size and extent of the project. The railroad is housed in a very large building which was built specifically for this purpose. When you enter the show area, you begin a walking journey of about a mile that takes about 2 hours to view 8 miles of track – mostly HO scale and some O scale as well. The many scenes and spectacular vistas show almost any type of situation you can imagine – from train wrecks to airplane crashes, junk yards to baseball fields, canyons and bridges galore, haunted houses, ghost towns, mining operations, cityscapes and winter scenes. Lots of fun-filled scenes and many humorous and interesting stories will entertain you along the way. As you walk along, after you have seen multiple large and interesting vistas with multiple trains running through them, and when you are thinking, “Now I’ve seen everything there is to see in model railroading”, then you pass a sign that says you have only seen 2% of Northlandz so far. And the rest of the 98% of the railroad is even more impressive as you go along! There is an interesting use of mirrors in many of the scenes that make the landscapes look much larger than they really are. You have to look closely to see where the mirrors are, because they are not that obvious. The effect is amazing however. There are many fantastic displays of multiple kinds of bridges. One could learn a lot about bridge construction by studying pictures of all the bridges in this layout. Some are quite large and span across large canyons. The trains run flawlessly. There must be 40 or 50 or more trains all running at the same time and there were no derailments. Most of the trackage was continuous running; some were point to point. On the latter tracks, trains ran from one end to the other with a delay on each end, all operating automatically. The power room was also fairly impressive with about 125 transformers controlling various sections of track. It's all automated and the entire empire can be operated by one person. After you finish walking through the layout, you can then take a ride on a 1:1 scale train on a figure 8 track through the woods containing a tunnel and a bridge. The train picks you up and drops you off at a very realistic appearing railroad station. Overall, this was a fantastic and fun experience, not only for me, the model railroader, but my wife enjoyed it also. There was a doll collection in the building which was also very interesting. There is truly something here for the entire family. If you ever get a chance to visit Northlandz, I would strongly encourage you to do so. The modeling is realistic, imaginative, detailed, often humorous, always interesting. The scenery is vast, expansive and artful. The bridges and the many scratchbuilt structures are very impressive, especially some of the ones that have been built on the sides of cliffs. The humor is very entertaining. As a model railroader or even as a non model railroader, you don’t want to miss this! Northlandz from Greg Warth on Vimeo.